Even with revisions in design, construction costs caused severe financial difficulties. Following a disastrous rectorate, which the Bishop refused to induct, the parish sank under a burden of debt. By 1898 the church was completely insolvent and mortgages held upon it were foreclosed. It was sold at public auction. Then, due to the intervention of Bishop Huntington, it was rescued by a group of wealthy benefactors (including Roswell L. Flower, who served as Governor of New York from 1892 - 1895), who purchased it and deeded it to him personally. in a “most impressive and august ceremonial” to quote the newspapers of the day. The procession was headed by the Bishop and immediately behind him his Chaplain, the venerable Dr. Joseph M. Clarke, who had come to St. James Church almost exactly forty years before (A marble plaque in the vestibule next to the front doors commemorates this event). Saviour was Bishop Huntington's pro-cathedral and he took direct charge of its operation. His Episcopal Seat and Crosier remain at Saviour to this day. 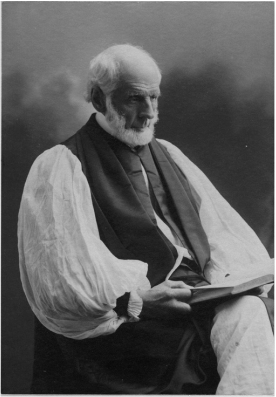 In 1899 the Rev. Karl S. Schwartz was appointed as “Dean of the Cathedral Church of the Saviour” to assist Bishop Huntington, and upon the latter's death in 1904, he became its first Rector. Rev. Schwartz graduated form Syracuse University in 1886, where he was a remarkable athlete – a baseball player and champion rower. After completing Divinity School he was ordained in Syracuse on May 27, 1889, and accepted a position at Trinity, Lowville. In the summer of 1890 he was playing a baseball game at Potsdam. A wealthy vestryman from the Church of Zion and St. Timothy in New York City saw this game and was immediately impressed. When the position of Senior Curate at his church became available, he urged it upon Rev. Schwartz, who accepted it in 1891. With the eruption of the Spanish-American War in 1899 Rev. Schwartz was commissioned as Chaplain of the First New York Volunteer infantry and went with the regiment to Hawaii. Upon his return, he took up his duties at Saviour. While St. James under Dr. Clarke had been described as “High Church” – under Rev. Schwartz Saviour moved more clearly toward Anglo-Catholic practice. He was the first rector to called “Father” and he acquired what were described as “some of the finest sets of vestments in the diocese.” In 1906 a room was made available at the church for the Order of the Holy Cross. Like Dr. Clarke, Rev. Schwartz also ministered to the community beyond his own congregation. In 1904 he baptized the first Syrian baby in the city – at the family’s request observing the Greek Orthodox custom, by which the baby is completely immersed three times, head first. In 1916 he instituted classes for teaching English to Armenian boys in the Parish House and allowed the Armenian Bishop use of the church for Mass.